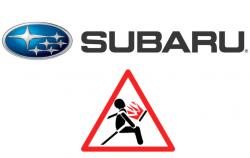 Subaru Tribeca, WRX, Legacy, Impreza and Forester vehicles recalled in specific states. February 26, 2019 — Subaru is recalling 783,000 vehicles to replace dangerous Takata airbag inflators in two recalls that include the 2010-2014 Subaru Tribeca, WRX, Legacy, 2010-2011 Subaru Impreza and 2010-2013 Subaru Forester. The Takata passenger frontal airbag inflators contain ammonium nitrate used as the propellant that deploys the airbags in crash impacts, but the chemical can become unstable and explode. Even a minor crash can cause the metal inflators to explode into sharp pieces of metal. Owners should have received recall notices explaining how Subaru dealers will replace the front passenger airbag inflators. With questions please call the automaker at 844-373-6614. CarComplaints.com has owner-reported complaints about multiple Subaru vehicles.